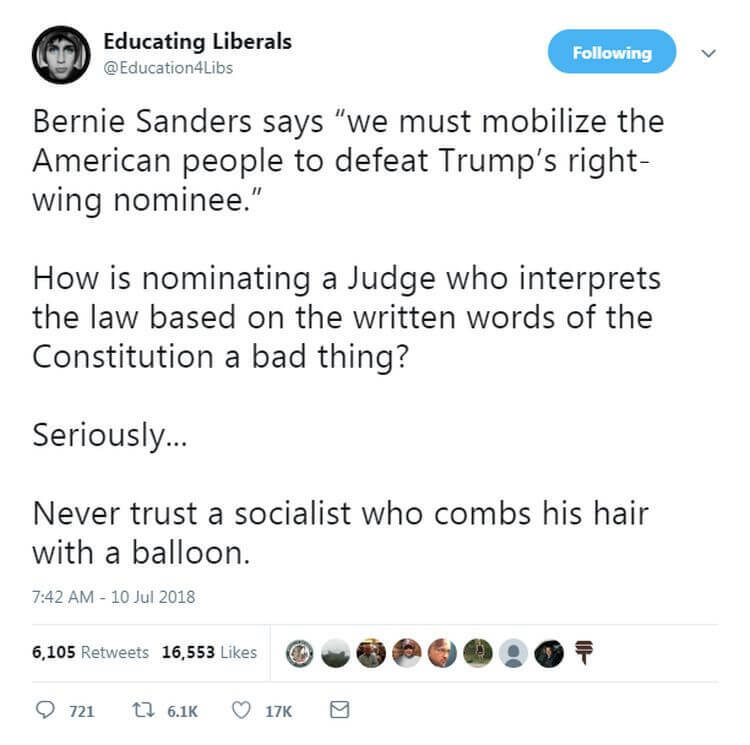 The “Bernie Sanders / SCOTUS” tweet below has everyone who sees it talking today, as it shows what buffoons most Democrats are. Of course Bernie Sanders wins the prize for the most buffoonish of the Senators. An 80 year old socialist trying to sell his “new ideas” which are nothing more than failed ideas of the past. When it comes to the Supreme Court though the clownish behavior hits a whole new level. How is nominating a justice who would interpret the law based on the Constitution a bad thing? Unfortunately for Bernie and the rest of his far left crew President Donald Trump’s Supreme Court pick just took huge step toward confirmation with the tacit endorsement of the Senate’s two pro-choice Republican members. Speaking to Politico, Alaska Sen. Lisa Murkowski and Maine’s Susan Collins both think President Trump could have “done a lot worse” than Judge Brett Kavanaugh. The two “centrist” senators wouldn’t say if they would vote “yes” or “no” on his appointment, but the pick of Kavanaugh seems designed to woo over the two senators more than a more conservative pick like 7th Circuit Court of Appeals Judge Amy Coney Barrett or another equally conservative nominee. Collins (R-Maine) told reporters that while she wouldn’t directly compare Kavanaugh with Barrett, she touted Kavanaugh’s experience and sounded warm notes about him while insisting she has yet to decide. “It will be very difficult for anyone to argue that he’s not qualified for the job. He clearly is qualified for the job,” Collins said. To top it off, both senators voted for Kavanaugh’s nomination to the D.C. Circuit Court in 2006. All Republicans need is a simple majority to confirm Kavanaugh. While Arizona Sen. John McCain is out recovering from brain cancer, there are 50 Republican votes in the Senate. A “no” vote from either Murkowski or Collins would throw the nomination into doubt. Conservative supporters of Kavanaugh are hoping that his confirmation could lead to the overturn of Roe v. Wade, but Republican senators seemed comfortable that the two female, pro-choice lawmakers would back him anyway. Sorting through Kavanaugh’s 12-year record on the federal bench and hundreds of thousands of pages of documents from his time in the George W. Bush administration and his work with independent counsel Kenneth Starr during the Bill Clinton presidency. Murkowski’s most important issues are overregulation, abortion rights and gun ownership rights. Collins said she does not apply an “ideological test” to their views, but mentioned parts of Obamacare that she would like to retain. Democrats have said that Kavanaugh’s appointment could mean another vote to throw out the Affordable Care Act.